The Kimberly region of Western Australia is a place many only ever dream of visiting. However, this 14 day adventure from Broome to Darwin will make this dream a reality. Your holiday will begin in the beautiful city of Broome, taking you a little north to the charming town of Derby. 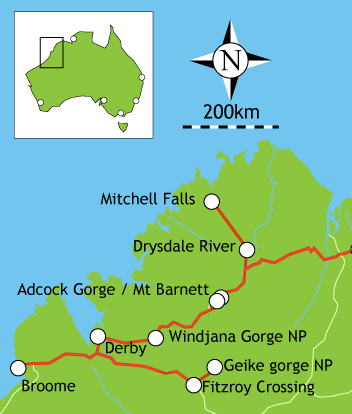 Heading deeper into the Kimberley Region will take you to places like Fitzroy Crossing and the Windjana Gorge National Park. Continue your adventure and discover the wonder and beauty of the Mitchell Falls and Mitchell Plateau, before you set up camp for the night in Drysdale and on El Questro Station. This trip will take you past some of this country�s most spectacular scenery and allow you to discover a world you may have never before thought possible. 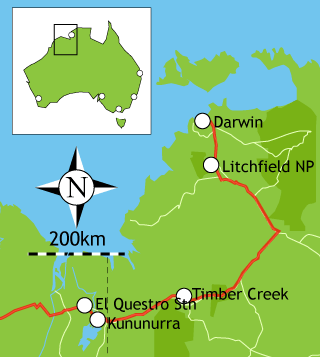 After passing through the town of Kununurra, your breath will be taken away by the wonders of Litchfield National Park, easily one of the territory�s most accessible attractions. Your adventure will finally draw to a close in the capital city of Darwin; a city bursting with colour and culture and eagerly anticipating your exploration of it. Your journey will begin in the delightful coastal city of Broome, a thriving city in which the outback meets the sea. While it is still part of Western Australia�s Kimberley region, it boasts beautiful beaches, a cultural lifestyle and a metropolitan feel. Spend some time exploring the city�s highlights, relaxing on one of the beaches or simply preparing for the next two weeks of your journey. Easily the most popular park in Broome, Roebuck Bay Caravan Park is an excellent holiday park, offering stunning views of the bay and clean and modern facilities. The park also enjoys a close proximity to the township, which means you can stock up on supplies and prepare for the trip ahead. Wake up on your 3rd day feeling refreshed, rejuvenated and ready to conquer the magnificent area surrounding the Fitzroy Crossing. While this area is classed as a �town� it still gives off that country feel and its driving force is without a doubt the Fitzroy River. The Fitzroy in full flood is one of the largest rivers in the world and is truly a sight to behold. Unfortunately this National Park does not allow camping, so you will have to extend your stay in Fitzroy Crossin. The Fitzroy River Lodge is a fantastic place to set up camp for the next two nights, offering all the luxuries you may have missed during your journey through the Kimberley. Nestled right on the banks of the river that made this area famous, this holiday lodge boasts a pool, restaurant and bar, tennis courts, and a handy on-site kiosk. Finish your journey in Darwin: the multi-cultural capital city of the Northern Territory. Boasting a rich Indigenous culture, an eclectic mix of lifestyle options, along with a close proximity to some of the state�s best National Parks, this city is a must to be explored on this amazing adventure. *Since the drive from Timber Creek to Litchfield National Park is so long, you may want to spend more than a day here. The park is so vast two days will probably be required to explore it with any depth.